Prior to this match I’d only ever been to Celtic Park on one occasion before, and that was for a European tie. I remember the atmosphere that night being pretty good so my expectations on the day that Celtic were to receive the league trophy were pretty high. Arriving at the ground, there was a definite buzz around the place. You could almost see the three years of disappointment falling off every single fan as they got closer to the turnstiles. The party atmosphere was certainly evident with novelty hats and wigs proudly sitting atop almost every head! 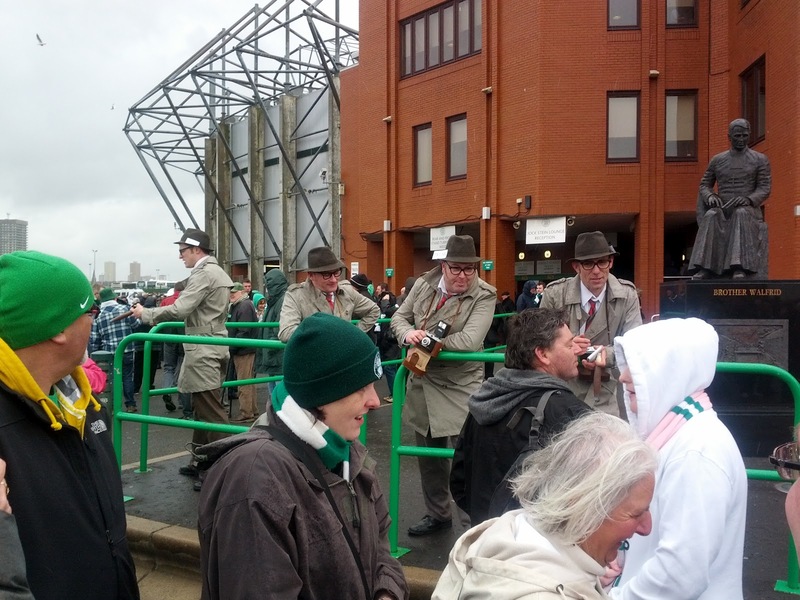 I particularly enjoyed the four guys outside the Main Stand who were dressed up as “old school” members of the press. 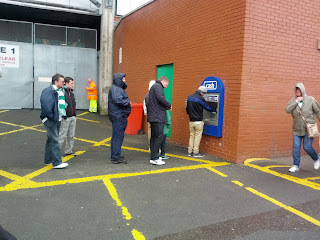 Having a walk around the ground before entry, I noticed something that I haven't seen at many (if any) other grounds – a cash machine outside. Brilliant. This was just the start of things though, as I discovered that Celtic Park is not only frickin massive, but is also an extremely helpful ground! For instance, did you know that under absolutely no circumstances are fireworks acceptable? I didn't! Had to leave all mine outside. The rocket launcher too, sadly. The signposting doesn’t stop there – oh no! Inside the ground, there is (genuinely) a very useful set of signs that offers fans an insight into which exists will take them onto certain roads. As someone unfamiliar with the area, I found this a treat. Less of a treat, sadly, was my view from the North Stand which, when looking left and right was superb. Face on, however, I was sat looking at a giant pole. Not only that, but Celtic Park is the only place I’ve been that even when seated under a well covered area, the rain still manages to swirl up and onto your face. Overall that, I like Celtic Park as a stadium so it gets a 7/10. The cold and rain would certainly have been a bit more palatable had I managed to get my hands (and mouth round) a good cup of tea and a pie. 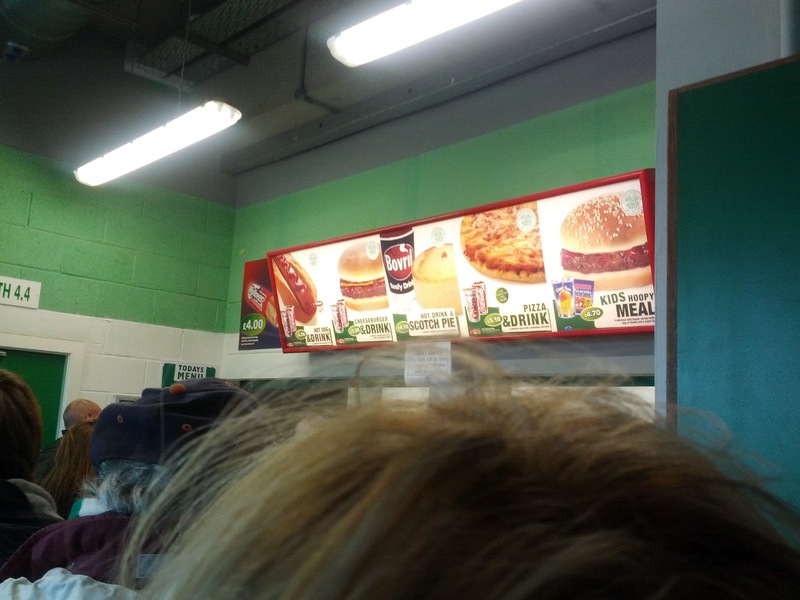 Unfortunately, I not only paid a ludicrous £4.10 for my usual combination, but they were also pretty horrendous too. Now, before I get carried away....we aren't talking Falkirk Stadium horrendous. My guts were still in tact and I managed to go to work the next day. However, there isn't a great deal to write home about. The pie was pretty dry and tasteless. The meat seemed to be one massive circular chunk, as opposed to a veritable mincy treat as at say....Ochilview....and the tea was fairly brutal. Not a great score, unfortunately. The food didn't add to my supporter experience in a positive sense. 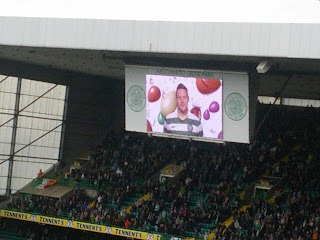 Something that was more enjoyable, though, was being in amongst the Celtic faithful. Obviously they had a lot to cheer about, having just won the league and all that. However, I was particularly impressed by the way in which the Green Brigade manage to keep the singing going, even at moments of natural lull and how they engage with all parts of the stadium. At a few points during the game, they will sing AT a part of the stadium, German football style, and wait for that part of the stadium to sing back. They then move onto another part and so on. This creates a great atmosphere. There's an unpleasant element to the Green Brigade, of course, that we've seen in the press and heard of many times – some of my Celtic supporting friends are the biggest critiques of this group – but on this occasion they offered nothing but a positive impact on the match and my experience at it. The club also do something that gets the fans engaged early doors. Instead of the team line up simply being read out, Celtic put the players on the big screen and get whichever player is being announced to say their first name. The crowd then respond with the surname in unison. Again, this has been stolen from German football but it's an element of the Bundesliga experience I enjoy. Overall, good score for the fans. Right, here's the section about which I have no doubt people will complain. 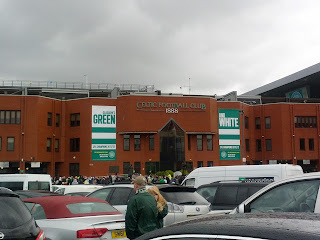 Despite winning 5-0 on the day, I actually didn't feel that Celtic played particularly well! With the exception of Gary Hooper, who scored all five goals, there were no real stand-outs. All of Celtic's goals were more as a result of shambolic defending by Hearts than by outstanding, creative stuff from the home team. Three were tap ins and one was a penalty – all of which came about from defensive errors. Otherwise, it wasn't as if Celtic were peppering Hearts goal with shot after shot and playing liquid stuff. That said, some of the play was very enjoyable to watch. Hooper's movement is quite superb. Samaras, when he gets the ball and runs at players is a terrifying sight and, fair play to him, Charlie Mulgrew has indeed turned into a fine footballer with much improved positional sense and use of the ball. All in all, I've scored Celtic quite highly but that's more for the Hooper-factor than anything else. He is a fine player and one who I rated very highly indeed. With all that said, Celtic score pretty well. 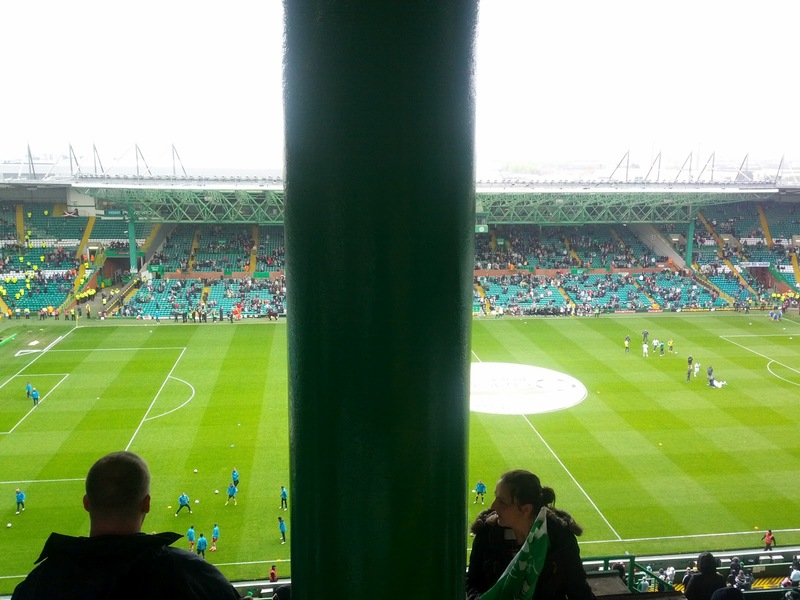 The stadium offers a perfectly good viewing experience – just watch that you don't end up behind a pole! - and while the catering is pretty poor, the fans (based on this game certainly) create an excellent atmosphere. With guys like Hooper on the park, there's also the chance of a bit of magic. However, I did end up paying £31 for my ticket and, despite the scoreline and fan experience, I just can't in all honesty say that Celtic Park is as good value as some of the SFL clubs charging nearly two-thirds less to get in. 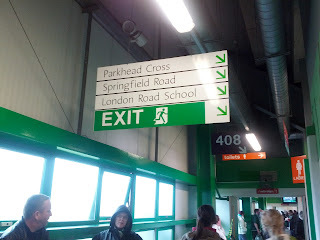 If you've never been to see Celtic before though, especially if you are reading this as a neutral non-Scot looking to take in an SPL tie in Glasgow, I’d have to say that based on my two experiences at Ibrox and Parkhead....the East End of the city is probably a better option for all round value. I came across this blog while searching for an image on Google Images for a picture of Celtic Park higher than 2MP res. Your pole picture came up and I saw it was a blog. 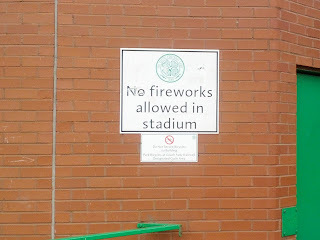 One amendment you can now make though - Parkhead is the ONLY place in Glasgow you can see SPL action! Haha! At the time it was written, it was entirely accurate! Thanks for taking some time to have a read and place a comment though. Much appreciated.